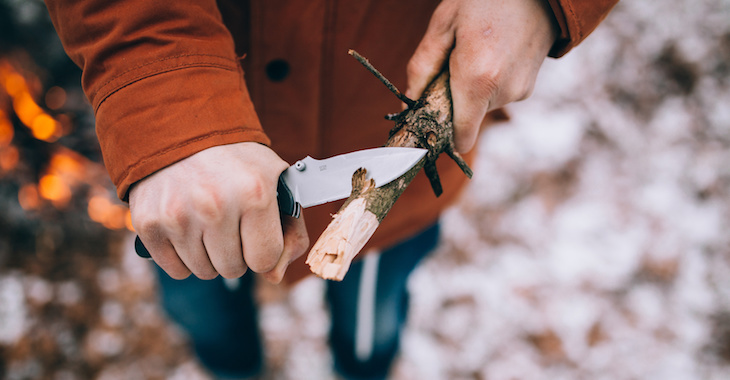 Pocket knives have as many uses as you can find for them, from cutting electrical wiring around the house to doubling as screwdrivers when one is unavailable. This also makes them great gifts under 100 especially as some manufacturers allow you to opt for a personalized engraving. The sturdier ones might be used as military gadgets if you are looking for a cold steel addition to your tactical gear. All in all, we’ve featured some of the most popular and accessible pocket knives on the market today. This Elk Ridge Ballistics offer allows you to add a laser engraving to any of the knives they offer. There are a number of font options available, and you can use up to 40 characters on two lines for a message fitting a special occasion, the intended user’s name or anything else you can think of. This can make Elk Ridge knives great gifts for bachelor parties, weddings and anniversaries, especially as a piece from the company won’t set you back by much and they offer both fixed and folding models for a wider choice. This knife has been designed to offer as wide a range of function as possible to make it suitable for survival and emergency situations. For the latter cases, it has a specialized seatbelt cutter in the hilt and a steel-tipped glass breaker that can help you get out of a car wreck or a burning building. The 3.5-inch tanto blade has both a serrated and a smooth edge so that it can be effectively used for cutting small tree branches as well as general tasks. To prevent rust from forming, this is made from stainless steel and fortified with alloys. This is a companion knife for an outdoor camp and can handle any related task, from carving wood to gutting fish for dinner. At only 8.6 inches in length and including a hard plastic sheath, it can be easily carried in a glove compartment for general use but don’t expect it to fit regular pockets. The carbon steel blade is specially treated to resist rust and features a Scandi type bevel, which makes it significantly better at cutting than a regular piece, at the expense of convenience, as it requires more skill to sharpen properly. 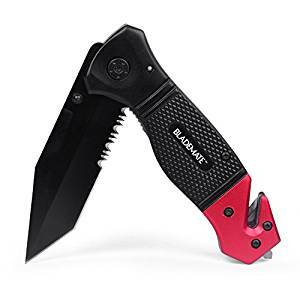 The Gerber Paraframe Mini will be very easy to carry around as it only measures 3.07” when folded and might be legal in all regions of the country and abroad since it only has a 2.22” clip point blade. This unit is made out of high carbon stainless steel for a superior cutting ability while regular stainless steel was used for the open frame handle. The para-frame configuration makes it a lot easier to open in an emergency and also significantly reduces the weight at no cost to structural integrity, so it will serve well in outdoors situations where resistance is paramount. This Gerber model takes portability one step further with only 2.4 inches of total length when folded. At this size, it uses a utility blade and can accept either a standard one, which is included in the package or a contractor grade one for better cutting ability and resilience. This makes it an effective wire and box cutter that has a few added features to give it an edge over a conventional piece, like the ability to lock the blade in place. This holds on with just one screw, so it will be easy to replace if it gets chipped or loses edge. This is an easy to use replacement blade folding knife specifically designed for outdoor functionality. The black-oxide coated blade holder adds additional support to the razor blade, making this nearly as durable as a regular knife while also sharp enough to shave with. A patent-pending glass and nylon material has been used for the hilt to give it better grip even when your hand is wet. The removable pocket clip is made from the same stuff, which makes it more resistant to bending — an all-to-common problem with metal ones. To top things off, you’ll also be getting a total of 6 blades. If you’re a fan of tacti-cool equipment, then this folding knife should be right up your alley. Besides looking well next to an all kitted up Ar 15 it also features the Punisher skull logo on the hilt. Otherwise, it is a solid piece which flips with the aid of a spring to release a 3 ¼-inch black coated blade. The whole thing is rather hefty and solid enough to be used outdoors when camping or hunting, which might be best suited for, as at around 5 inches folded, it takes some space in your pocket. This is definitely an urban switchblade, of around 2.63 inches when closed and 1.2 ounces in weight. It has three blades of different sizes which can very well make it into a fit replacement for a boxcutter since the surgical stainless steel used gives it plenty of cutting ability. So if you’re not such a big fan of carrying a clunky piece of plastic around the working site, then this will offer you a good alternative. The clip blade makes it great for cutting food when out of the kitchen, the sheepfoot one is ideal for carving wood, while the spey is a multi-purpose piece. Another tacti-cool piece, the M-tech 8.25 inch folding knife has quite a thick drop point blade which will make it ideal for outdoor situations. This is made of stainless steel and has a red finish, so it won’t rust as easily, while the handle is anodized aluminum, despite the fact that the red and black coloring might make it look like plastic or rubber. It can be opened one-handed with the assistance of a spring so you’ll be fast to use it in an emergency situation. The flipping mechanism is said to make a very satisfying sound when used. The task of finding a gift that will really surprise the recipient is extremely difficult. Thankfully, with the market offering every product you can imagine available for sale right at your fingertips, it can get easier to find something truly unique, but pinpointing exactly which of the products could make for a good gift can seem intimidating. If you’re on the lookout for cool pocket knives for yourself or a friend, you should consider what that the person or you will use the product for. For example, pocket knives can make for perfect gifts for fishermen and women, so you have to know if they’re an outdoor enthusiast. Are they handy? Do they tend to fix things around the house? Do you know the different types of pocket knives, or what size to choose? In the end, what makes for a good pocket knife? Most pocket knives nowadays come with neat looking design but we have to bear in mind that we’re choosing a product that will have to pass the test of usability. What use of a good looking pocket knife if when you have to use it the blade is sharp enough or suitable for the task at hand? This is why you must make sure that the knife is easy to use, practical and convenient. Choices are good for the consumer but when you are overwhelmed and don’t where to start, they can turn out to be overwhelming. You must be aware that there are a lot of different types of pocket knives and not everyone can accomplish the same set of tasks. If you want a knife to use to cut ropes or wood, you’ll have to be careful on what blade type you choose. If you want to do more with your pocket knife, you might want to consider a multi-tool knife. The size of the knife should also be considered unless you want it to be uncomfortable to fit in your pocket. In order to select and help you understand what a quality pocket knife should encompass, we have looked at what some of the best pocket knives reviews have to say. We’ve taken into consideration size, price, material and overall usability. Take a look at our guide and see if doesn’t help you. 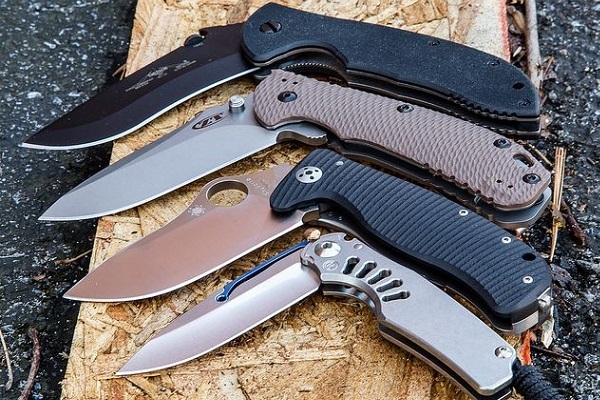 When it comes to pocket knives, expensive models are indeed better but that doesn’t mean that budget alternatives should be overlooked. If you don’t want to commit to buying a top of the line pocket knife, maybe because you don’t know how much you’re going to use it or perhaps because you tend to misplace your things and don’t want to risk losing it (we’ve all been there). Just because you go for an affordable choice, that does not mean that you’ll get something worse. The more expensive pocket knife will be better, but not by a considerable margin. Cheap pocket knives will require sharpening more often. One thing that you should know about pocket knives is that maintenance is key. A cheap but maintained knife will beat an expensive but not neglected knife. When it comes to pocket knives size does matter. Depending on your needs, you may want to choose a size that will work for your needs, not against them. The recommended size is medium because it combines the best of all sizes. It is big enough to do the task you would expect from a knife yet small enough to confer it mobility, making it easy to carry. What’s the point of a pocket knife after all if you can’t carry it in your pocket? What you need to know about the blade of a pocket knife is that they come in three forms: serrated, plain and partially serrated. Serrated blades resemble a saw, they are perfect for cutting wood or rope, but not that good when it comes to making a clean cut. Plain blades are what you probably picture when you think about a knife, a straight-edge blade perfect for making clean cuts. It does, however, fail where the serrated blade succeeds, in cutting harder material such as wood and rope. Partially serrated knives combine the best of both worlds, with a blade that is half plain and half serrated. While they are good for superficial cuts, if you need both clean cuts and to be able to cut harder material, there is a solution for you. Some pocket knives now come with more than one blade. This allows you to have both a plain and serrated knives. Besides that, you can also have different handy tools such as a can and bottle openers, which will surely make owning a pocket knife even more practical. When using a pocket knife you want above all to be safe. Operating a blade can lead to accidents and cutting yourself accidentally is not at all pleasant. You can see now why purchasing a pocket knife that comes with a lock mechanism is important. What is the lock mechanism? It’s quite simple. When using your pocket knife you have to first pull the blade from the housing so that you can use it. The housing then becomes the handle of the knife and you don’t to accidentally bend the blade and have it come back to the housing when using it. Your fingers definitely don’t want that. Investing in a pocket knife with a good locking mechanism is a necessity, you should make sure that the pocket knife you buy is not dangerous to you and the people around you.